By Angel Flowers: A little over a year ago I wrote an article for Boxing News on how I believed certain matches would not be made. A lot of boxers talk the talk but fail to walk the walk when it came to certain opponents. These individuals used three main techniques when avoiding a fighter. The first technique is pricing themselves or their opponent out of a match. They either want a far bigger piece of the pie than they deserve or try to get their opponent to take a small flat fee. The second technique is by dismissing what their potential foe has done. This normally results in name calling and boasts of what would happen if they ever met in the ring. The last technique is just ignoring their potential foe altogether. Below are the 2019 Hide and Seek Champions. I correctly predicted that Tyson Fury would be back in 2018. I also predicted that Anthony Joshua would not fight either Lineal Heavyweight Champion Tyson Fury or WBC Heavyweight Champion Deontay Wilder. All of those things happened. Anthony Joshua has talked at length about how he wants to unite the heavyweight championship and give the fans the fights they want to see. I don’t think anyone would have rather saw Joshua defend against Joseph Parker instead of Deontay Wilder. It doesn’t matter who anyone thinks would win the fight, what matters is that would have been a better fight then what we saw in the ring. In the ring we saw a referee that was more at home on a police force since all he did was break up the fight whenever Parker got close. While that wasn’t Joshua’s fault a fight with Wilder would have been entertaining for as long as it lasted. Parker did have a version of the title so it was assumed that Joshua would fight Wilder next, not old and undersized Alexander Povetkin. Joshua thought the public would be happy with his excuse that Povetkin was his mandatory, only his die-hard fans bought that excuse. Everyone else wanted to see him fight either Wilder or Fury. If Joshua offers either one of them a 55/45 split they would both take it. Both Joshua and his opponent would make more money than they ever have and the fans would be happy. Instead of coming to terms with the Lineal or the WBC champion, Joshua has decided to fight Jarrell Miller. Fury and Wilder have both stated they want to fight each other but rest assured they would put their battle on hold for a chance at bigger money. In 2018 I predicted who Joshua would fight and was correct. In 2019 look for him to fight the following fighters and only someone of this group. Adam Kownacki, Dillan Whyte, Oleksandr Usyk, Kubrat Pulev or Robert Helenius. Joshua will run and hide from Wilder and Fury. I personally think both fighters would beat him. I also give Joshua a much easier time of beating Wilder if he were to win. I do not see any way Joshua beats Fury which is probably the reason he is hiding. I called out Gennady “GGG” Golovkin last year as well. Golovkin has long claimed he wanted to unify the middleweight title. I called bull on claim when he first said it, he is not willing to fight anyone, anywhere. He only wants to fight big names for money and will avoid any tough fight out there. He said he would go to 154 to fight forty year old retired boxer Floyd Mayweather. Both of the Charlo brothers, Jermell and Jermall called him out at that weight and he didn’t even bother with a response. GGG Then got the fight he wanted with undersized middleweight Saul Alvarez. That fight ended controversially in a draw. At that point GGG should have fought then WBO Champion Billy Jo Saunders. GGG ran from that fight like Usain Bolt in a 100 meter dash. Instead he wanted to fight Alvarez again. When Alvarez was suspended GGG still refused to fight either Saunders or Daniel Jacobs who was his mandatory. GGG tried to fight a young and undersized JUNIOR MIDDLEWEIGHT Jaime Munguia instead. When that fell through he still didn’t take either of those fights which resulted in him being stripped of the title. GGG got his fight with Alvarez again and spent most of it running away from the small Mexican redhead. The WBC gave him a path back to his titles by facing one of the people he ran away from, Jermall Charlo. GGG of course declined that fight and has only talked about how he thought he won. Whether he thought, or I thought, or anyone thought he won doesn’t matter. What does matter is that he has a loss and ran away from being named Alvarez’s mandatory because he didn’t want to fight Charlo. In 2019 GGG will still be running from both Charlo and Saunders. I do not believe he will fight either one of them nor will he go up in weight to capture a Super Middleweight title like Alvarez did. He will try to talk himself into a third match with Alvarez and avoid any tough fights. Look for him to fight anyone not named Charlo, Jacobs or Saunders in 2019. Thurman has been injured for two years. A pass can be given for that but in my eyes he is scared. He will fight any welterweight not named Errol Spence or Terence Crawford. Keith “One Time” Thurman has transitioned from a feared knockout artist to a slick boxer. The problem with his potential opponents is that Spence and Crawford are better at it than Thurman is. I think they both stop Thurman, Spence with speed and power by KO and Crawford by slickness and ring I.Q. which would result in a TKO. Thurman knows this and will not fight any of them in 2019. 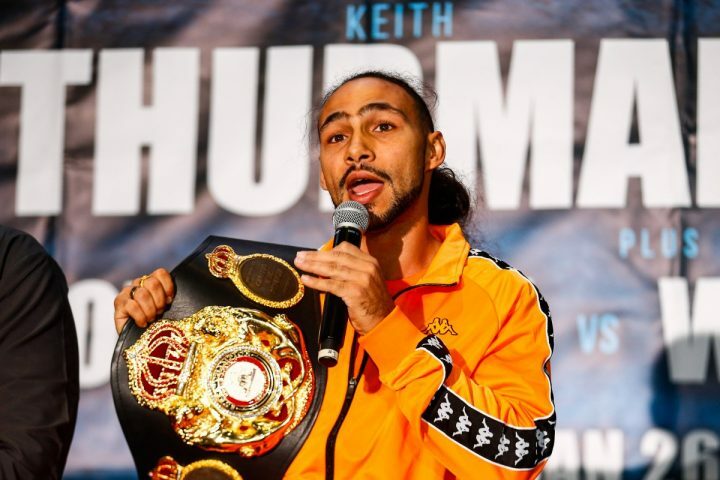 So far, Thurman has called out forty year-old Manny Pacquiao and has made no mention of uniting the welterweight division. I believe Spence will fight anyone in the welterweight division and so would Crawford. Thurman is looking to take it easy against opponents who have a flaw that he could exploit. It is like a paper-rock-scissors game except he would be on the losing end. The only boxer I am going to name here is Vasily Lomachenko. There are plenty of other fighters that I mentioned who have potential opponents scared but Lomachenko is doing it across weight classes. I am not entertaining Lomachenko fighting anyone at Light Welterweight because those guys are too big. It would be like Deontay Wilder calling Spence a coward for not facing him. Lomachenko has been showing cracks in his armor but is still willing to fight whoever whenever. Lomachenko has went up from featherweight to lightweight in 13 fights and is a three division champion. Lomachenko is easily found by any champion at super featherweight or lightweight. I doubt Gervonta Davis will fight Lomachenko in 2019 due to his promoter and I doubt Mikey Garcia will fight Lomachenko unless the smaller man goes up to 140, a weight too big for Lomachenko.